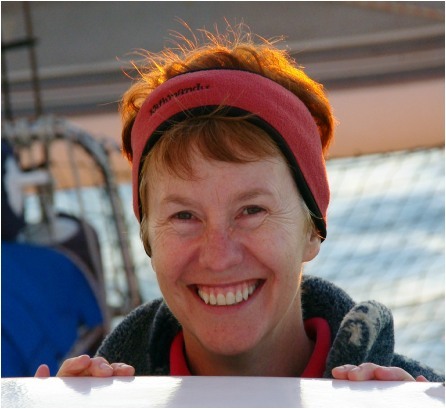 In 1997, two weeks after marrying Grant, we undertook a two day sailing course on Port Phillip Bay in Melbourne. The first day was a red alert warning (unsuitable for small craft) where the only two boats on the bay were from the sailing school. Grant and I were part of a six person crew on board the sailing school’s J24. The J24 did not have an engine and we were all amazed at how easily our instructor got us to sail away from the marina berth. We flew across the bay with everyone getting soaked from the large waves – even the school’s banner got ripped off. Ignorance is bliss! The following weekend was the exact opposite – almost no wind. We were becalmed in the shipping channel and had to use the tiller to paddle ourselves out of the way of an approaching container ship. Soon after our sailing course we purchased our first yacht, Mirage, a Sonata 7 trailer sailer. Mirage was a very forgiving boat. She enabled us to learn how to sail properly. The Sonata Association was and still is a great organisation which helped us master the skills necessary to handle our boat safely and with confidence. We have enjoyed many a cruise with other like-minded sailors. 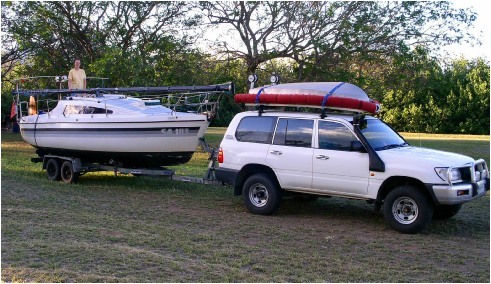 We even used Mirage as a caravan for our trip to the Whitsundays. You get a few strange looks when you enter the caravan parks but that is all part of the charm. This was just the most wonderful holiday in perfect weather with Mirage proving to be a little pocket cruiser and more than comfortable for a five week stint in this tropical paradise.